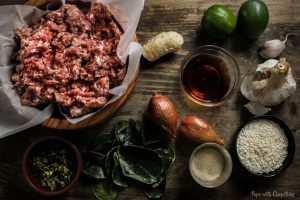 Larb (Pronounced as Lahp, the R is muted) is a minced meat salad made with fresh and flavourful ingredients such as mint, limes, lemongrass, ground meat and ground up toasted rice. 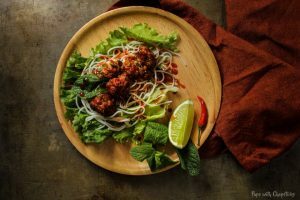 Traditionally, larb is served with a side of sticky rice, this lemongrass pork meatballs recipe will show you 3 alternative ways to enjoy this! Let’s talk about flavours. What does larb taste like? This is a VERY flavourful dish. The most predominate flavours are from the lemongrass and kaffir lime leaves followed by a bit of tang from the limes and the saltiness and umaminess from the fish sauce. Mint is a big part of this dish. I didn’t put mint into the actual pork meatballs itself because I find that cooking mint, mutes the flavours so it was served fresh on the side. For this pork meatballs recipe, most ingredients can be found in your local grocery store. Kaffir lime leaves, galangal, and lemongrass may not be available at local grocery stores but can be found at an Asian grocery store. Although galangal looks similar to ginger, it actually does not have the same flavour so it cannot be substituted with ginger. Galangal has a clean, citrusy and piney flavour, whereas ginger is has a sharp, spicy, warm and peppery flavour. If you cannot find galangal, this can be omitted. On low heat, toast the rice in a frying pan for 5-10 minutes or until golden brown. Once it looks nice and golden, wait for it to cool and grind it up in a mortar and pestle or food processor. If you are using fresh lemongrass, use only the thick stalk on the bottom and discard the upper half that looks dry. The flavour is at the bottom. Remove the stem and spine from the kaffir lime leaves. This is a very waxy leaf and keeping the spine and stems make it harder to break down. In a bowl, combine the pork, spices that were ground up, the ground up toasted rice powder, lime juice, sugar and fish sauce and mix. 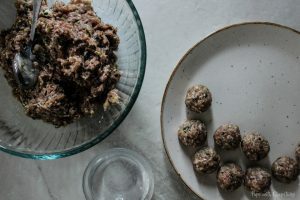 Tip #1 : To taste if the pork meatballs have enough flavour or salt, put 1/2 tsp of meat mixture into a microwave safe bowl and heat it up to do taste tests! You can mix this up by hand or with a stand mixer. Once the mixture is well combined, roll them up into 1-inch meatballs. This will make between 30-40 meatballs. Tip #2: If the meat is sticking to your hands, keep a small bowl of water by your side to lightly wet the palms of your hands before rolling. In a frying pan add 1/4-1/2 inch of oil and set the heat to medium and wait until the oil is hot or shimmering. Add in the meatballs and fry them for 5 minutes or until golden brown. LET’S EAT – 3 WAYS ! 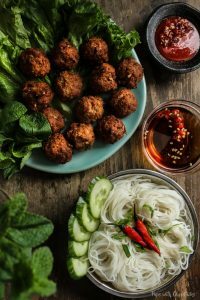 Add some vermicelli (or rice) in a bowl, add some pork meatballs and top it with refreshing garnishes such as cucumbers, and mint and a wedge of lime for some extra zing. Top it with nuts for a bit of crunch! Sauces: Sriracha, Nuoc Cham (A sweet, sour and salty dressing), thinned out hoisin sauce. For the lettuce wrap, you can use any type of lettuce. We found that green leaf lettuce (different from the iceberg lettuce and romaine lettuce) and boston lettuce were easiest to wrap with. Top it with vermicelli noodles, mint, bean sprouts, a squirt of lime, any type of additional fresh vegetables. Sauces: Sriracha, thinned out hoisin sauce. The salad is one of the easiest ways to eat this dish. Use any type of greens and veggies and toss it with a light dressing such as noac cham. Toppings can also include fruits for a bit of sweetness (like mango) and some toasted nuts for a bit of crunch. 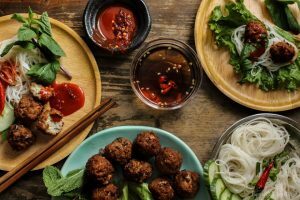 Flavourful lemongrass pork meatballs made with fresh mint, limes, lemongrass, ground meat & toasted rice with 3 ways to enjoy this flavourful dish! 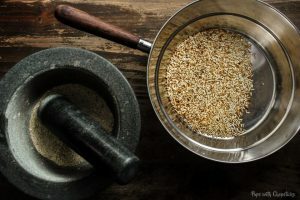 Once the rice has been toasted, let it cool and grind it to a medium powder with a mortar and pestle or food processor and set it aside. In a food processor, grind the: keffir lime leaves, galangal, lemongrass (if using whole stalks), garlic and shallots. In a large bowl, combine the ground pork, lime juice, fish sauce, sugar, toasted glutinous rice powder and freshly ground spices together and combine it by hand or stand mixer. Roll the meat mixture into 1 inch meatballs. In a pan, put 1/4 to 1/2 inch of oil on medium heat and wait for the oil to get hot and shimmery before adding in the meatballs to cook. Cook the meatballs for 5-7 minutes, until golden brown. Flipping them every 30 seconds to evenly cook it. 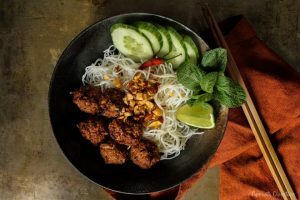 As a Noodle Bowl – Boil some vermicelli noodles and add the noodles and meatballs into the bowl. Garnish it with mint, cucumbers, a wedge of lime for some zing. Top it with crushed nuts for a bit of crunch. 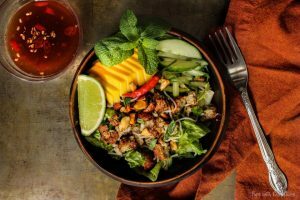 As a Lettuce Wrap – As a wrap we found using Boston lettuce or green leaf lettuce (different from iceberg lettuce and romaine lettuce) the easiest to roll with. Top it with vermicelli, crushed nuts and bean sprouts. This is a very creative take on a meatball recipe! Looks tasty! I haven’t tried a lot of lemongrass flavored things, but this looks amaaaazing. 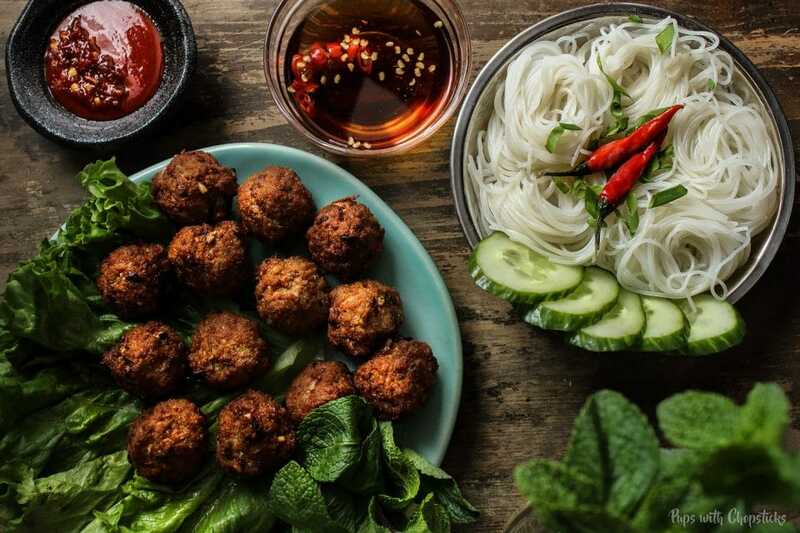 OMG I need, need, need to try this – lemongrass in meatballs sounds awesome. Everything about these looks so delicious. I’m a sucker for a noodle bowl, but those lettuce wraps look pretty tempting too! It’s definitely fun to switch that up a bit, when I’m feeling bored I definitely do the lettuce wrap! Makes things a bit more interactive! 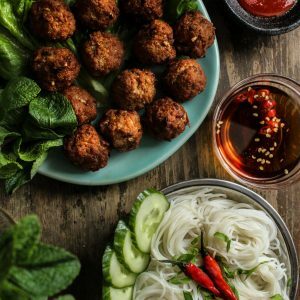 I love asian style meatballs and the options you suggest us to make are really interesting. I have to buy some lemongrass and make them soon! I’m so glad that I stumbled upon your blog:) Stunning photography and flavorful recipes. I’m so in love with these meatballs right now and want to gobble up the whole thing. I’ve never been lucky enough to find lime leaves in the Chinese grocery stores though! Wow! All the different flavors in this recipe sound amazing. I really need to expand my horizons and this sounds like a perfect recipe to start with, thanks! I totally approve of your decision to turn larb into a meatball– genius! Thai food is my absolute favorite. I get takeout from my local Thai place at least once a week and it’s delicious, but can get a bit redundant. I’m always looking for new, fun ways to enjoy the classic dishes and this definitely fits the bill. I think I’ll actually serve it up all three ways because why not? I want them all! haha Thanks for sharing, Joyce! What a flavour bomb! Between those pics and the recipe I’m drooling on my keyboard. I think I like the noodle bowl with nuoc cham idea the best although the lettuce wraps and salad look really good too. I’m also thinking making a burger patty and putting on baguette banh mi style would just be completely over the top. Maybe even too good. Awesome! These look fantastic! A nice brown and crispy outside with some amazing flavors inside. 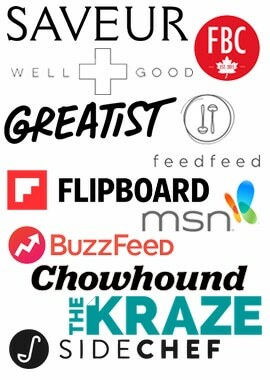 I’m a sucker for a good noodle bowl, but I love all the options that you’ve provided! Thanks Alison! I LOVE noodles too! 😀 Noodles all the way haha! 🙂 I get bored a lot with what I eat so I thought maybe a few ways to enjoy this on different days might be neat! this sounds so good! i basically put fish sauce in everything (if it’s savory and bland, in goes fish sauce), and the toasted rice sounds like it’d be so fragrant. and if larb meatballs are tasty in lettuce wraps, then why not spring rolls, too?! spring rolls are hot weather, summer food for me so i’ll wait a bit on those, but dang i’m already dreaming of them. Damn! I think it’d taste amazing in spring rolls!! haha 😀 but yea I’m with you on that – fish sauce definitely has amazing flavour 😀 I’m almost substituting it for everything soy sauce related now as well!